Enchanted Steampunk 2 - 3 Sizes! Gears, steam, keys and top hats can mean only one thing…Steampunk! This Enchanted Goggles with gears and wings design captures the highlights of the Steampunk revolution. See sizes below. Sue O'Very Designs is running a buy 2 get 1 free promotion! Promotion ends on 04/30/2019. Gears, steam, keys and top hats can mean only one thing…Steampunk! 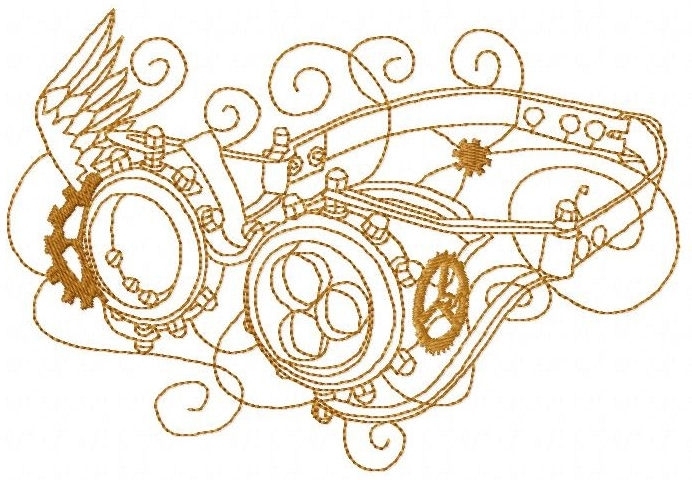 This Enchanted Goggles with gears and wings design captures the highlights of the Steampunk revolution. 3D Summer Flowers Set - 2 Sizes! Enchanted Steampunk Set, 12 Designs - 3 Sizes! Finish Size 3.93" x 2.71"
Finish Size 6.99" x 4.82"
Finish Size 9.11" x 6.28"
This design is also available in a larger set. Just click on the "Enchanted Steampunk Set, 12 Designs - 3 Sizes!" link above in the "You might also like" section for more information.